Fondas are small restaurants or food stands, usually cared for by their owners and family. They sell homemade food, typically Panamanian dishes. Some fondas are only open for breakfast, while others also open for lunch and dinner. Some have chairs and tables for people to eat, while others only offer takeout. What is great about fonda food is that it is affordable and 100% local. The menus vary daily and plates start at $3, for a meal like sancacho and rice. 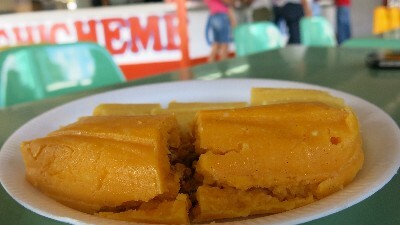 A typical fonda breakfast usually consist of Panamanian fried snacks carimañolas and hojaldres, corn empanadas, corn tortillas or flour empanada, which can be stuffed with ground beef, tuna or chicken. Other popular menu items include fried chicken entrails, cow entrails, fried fish, fried chicken, stewed sausages and fresh or dried corn bollos (depending the season) . For lunch rice is a fonda staple. The rice served is often white rice, sometime with coconut, veggies or guandu. Soup is also a common lunch item, typically sancocho or beef soup and sometimes a freshly brewed miniestras made from beans, or peas and lentils. The main is typically beef, chicken or pork is roasted, fried or served in a tomato sauce. A complete meal generally includes rice (white, with coconut or guandu), meat (chicken, pork, beef or fish), miniestras (lentils, beans or yellow peas) and salad (vegetables, potato or slaw). Fondas offer their customers free water with their meal, the water they serve is unfiltered. Most fondas do not serve beer or alcoholic beverages, and those that do are typically more of a bar environment. Open for breakfast, lunch and dinner every day from 6:30 am to 8:00 pm, Don Saul is located near the entrance of Las Lajas on the Pan American highway between Laundry Mat and Nido Boutique. The menu changes daily. Breakfast varies between, hojaldres, empanadas, tortillas and eggs. Coffee or tea is available for drinks. Lunch items often include fried, broiled or stewed chicken pork and beef, and soups all served with rice. For orders and reservations call 6982-3792. Open for breakfast from 5:00 am until 10:00 am. It is located at the entrance of Las Lajas near the pedestrian bridge. Mrs. Juliana prepares homemade tortillas, empanadas, bollos, hojaldres y carimañolas. Yucca is offered fried or boiled in salt water. She often also has boiled eggs, pork ribs, and patacones. Morning beverages include coffee, hot chocolate and different kinds of tea. Ms. Juliana is also available for special orders and can be contacted at 6531-0118. This fonda is located across from Super 99 next to Dr. Reyes veterinary. Open for breakfast and lunch, Monday through Saturday from 6:00 am to 3:00 pm. For Breakfast they have traditional Panamanian fried foods (empanadas, tortillas, carimañolas) that can be served with a steak or beef liver in tomato sauce. On Saturday and Sunday they prepare picadillo de bofe . Lunches may include sancocho or beef soup, served with white, coconut or guandu rice. Main dishes are chicken, pork, beef or fish, accompanied by rice and a potato or vegetables salad. For drinks, they have sodas, canned juices or natural drinks made with seasonal fruits. El Rincon Cubano is located on Avenida Roberto Eisenmann next to the Rest. Malibu, open Monday through Saturday from 6:00 am to 8:00 pm and Sundays from 8:00 am to 3:00 pm. Breakfast, lunch and dinner is served. Panamanian fried foods are served for breakfast with tea, coffee, juices and sodas to drink. Lunches and dinners include sancocho or beef soup, rice, beef, chicken or pork. This fonda also sells cold beers and is a local watering hole for Coronado area workers looking for a place to get together after work for a few beers.